There are a couple of ways to create a chart. We are going to discuss the two quickest methods. This is an excerpt from our course “Creating Effective Charts in Excel“. Often you just want a quick and dirty chart –one that doesn’t have to look that great since it is just for you. In this case, you select your data and press the F11 key and a full size chart is displayed on a separate sheet. If you want the chart to appear on the same sheet as your data, then press ALT+F1 instead of F11. 2. Select the data you want to chart. You want to make sure not to include totals when you select your data as it will skew the chart. 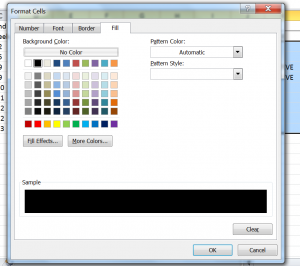 You want to select your column headings so that you have labels in your chart. A full size chart appears on a new worksheet entitled Chart 1. You will notice that it is lacking titles and other documentation that would be needed for other viewers but for your individual use it will generally suffice. 3. Press Alt key and the F1 key at the same time. You should see a small chart appear on the sheet with your data. You will notice that it is lacking titles and other documentation that would be needed for other viewers but again -for your individual use it will generally suffice. The chart is considered a graphic object so you can move and resize it if it is in the way of your data. 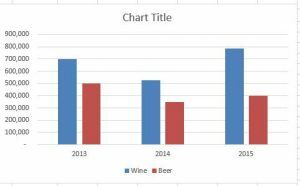 Check out our course Creating Effective Charts in Excel. I thought I would share this problem I ran into charting so that you don’t start banging your head against the wall as I considered doing. I have used this same data in a many different versions of Excel and never had a problem until Excel 2016. I charted some data and I went merrily on my way until at some point I noticed big problems with my X axis. Do you see the problem? Take a look at the X axis. At first glance, it looks okay and then… hmm.. issues here. 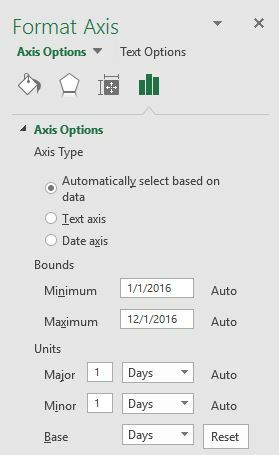 Excel 2016, by default, apparently uses days so it is showing the first day of the month. Unfortunately, most businesses are more interested in the last day of the month. To fix this, right-click on the X axis and select Format Axis and change the base from Months to Days. Your chart should now correctly reflect the data from Column A. 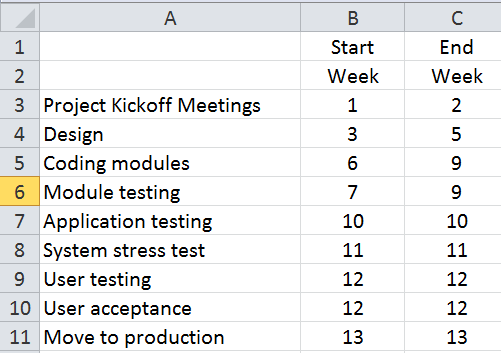 To continue the chart, add the weeks to the right that will be used to represent which project activity occurs during each time period. Now, we need to know what to do if the IF condition is TRUE. In this example, let’s put the word “RESERVE” in the cell. It can be any word or number, as long as it is consistent. If the condition is FALSE, let’s put a blank in the cell. Now, it would be nice to copy this formula. However, when a formula is copied, the cell references are relative. This means that if the formula in D3 is copied down to D4, all the row references are adjusted down one row. If that happens, we’re no longer comparing the 1 in cell D2. Now, we’re comparing to the IF function in cell D3. 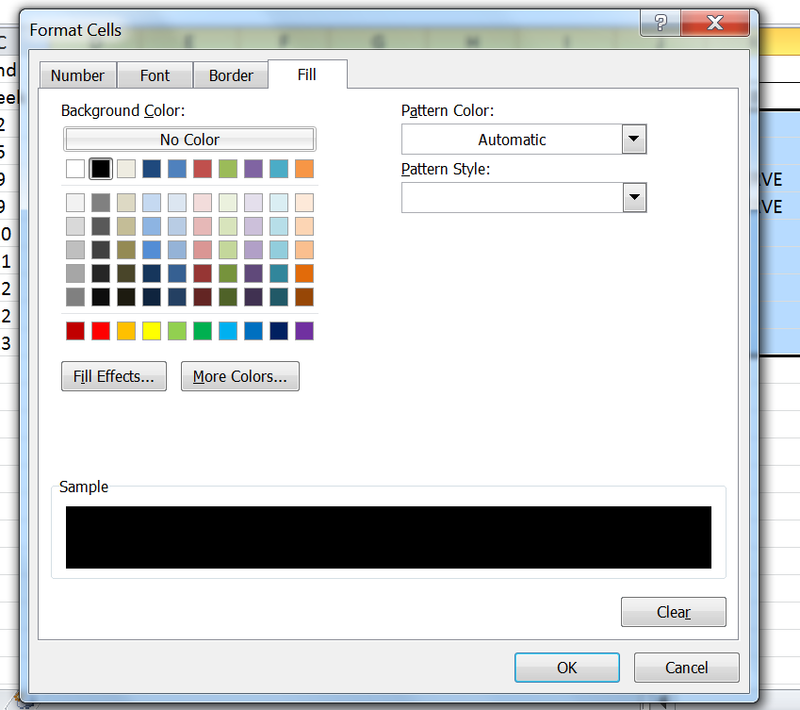 To overcome this problem, Excel allows us to use absolute cell references. Absolute cell references hold a particular row or column (or both) in place when formulas are copied. 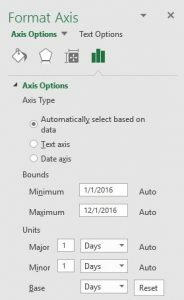 It is done using a $ sign in front of the row and/or column being used in the formula. In this case, if the formula is copied down, we know that we always want the amount in row 2 and also always want the amounts in columns B and C. Put a $ sign in front of the 2 in D2 and in front of the references for columns B and C.
Press enter. Copy the down to the end of the activities. Now, with the range D3:D11 selected, grab the lower right corner with your mouse (you should see a plus sign), click and drag over to column P.
Select the Fill tab and then select the color black for the color options. Click OK. Click any other area of the spreadsheet to deselect the range and your Gantt Chart is ready for use. 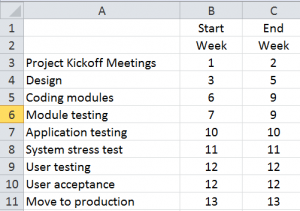 It’s an easy way to create a Gantt Chart without special software. You just need to know the IF function, the AND function, and Conditional Formatting. We also covered absolute cell references to make it easier to copy the formulas down and across.